We value lay participation and encourage lay leadership through the various entities listed below. The governing body of our congregation is made up of the church chair and six other members selected by the Leadership Selection Committee and affirmed by the congregation. The pastors also sit on the board, which meets monthly to discuss and discern issues of import to the mission and ministries of MCN. The Constitution is available here. 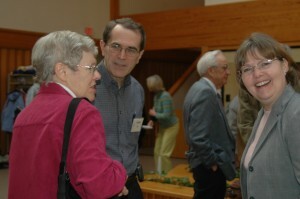 Congregational meetings are scheduled once per quarter, following a Sunday noon fellowship meal. We meet to share information with each other, so as to better carry out the mission of the church. All regular congregational participants are strongly encouraged to attend! Christian Education, Fellowship, Financial Stewardship, Outreach, Pastoral Council, worship and Youth Ministry are standing committees which care for the details of the life of the congregation. The minutes of their meetings are available in the Church Library (current & archives). VOLUNTEERS ARE EVERYWHERE AT MCN They greet, serve communion, care for children, clean, serve coffee, visit the sick, collect offering, bring flowers, and care for our building, just to mention a FEW activities which make the Mennonite Church of Normal a hospitable and joyful church community.